↑ The comoving distance of the future visibility limit is calculated on p. 8 of Gott et al. 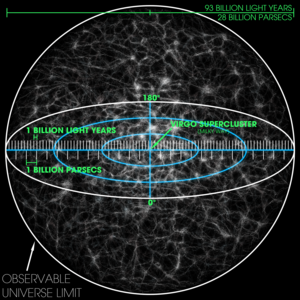 's A Map of the Universe to be 4.50 times the Hubble radius, given as 4.220 billion parsecs (13.76 billion light years), whereas the current comoving radius of the observable universe is calculated on p. 7 to be 3.38 times the Hubble radius. The number of galaxies in a sphere of a given comoving radius is proportional to the cube of the radius, so as shown on p. 8 the ratio between the number of galaxies observable in the future visibility limit to the number of galaxies observable today would be (4.50/3.38)3 = 2.36. 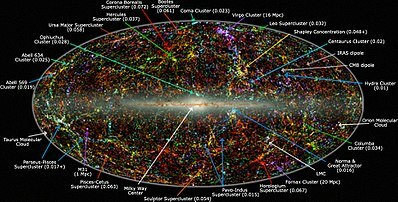 ↑ See also Faster than light#Universal expansion and Future of an expanding universe#Galaxies outside the Local Supercluster are no longer detectable. 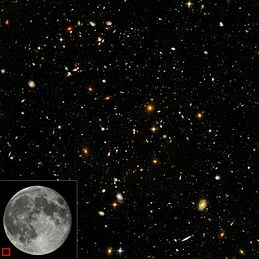 ↑ Big bang pushed back two billion years – space – 04 August 2006 – New Scientist. Space.newscientist.com. Retrieved on 2011-05-01. ↑ Bob Gardner's "Topology, Cosmology and Shape of Space" Talk, Section 7 আর্কাইভইজে আর্কাইভকৃত ২ আগস্ট ২০১২ তারিখে. Etsu.edu. Retrieved on 2011-05-01. ↑ ক খ SPACE.com – Universe Measured: We're 156 Billion Light-years Wide! ↑ Roy, Robert. (2004-05-24) New study super-sizes the universe – Technology & science – Space – Space.com – msnbc.com. MSNBC. Retrieved on 2011-05-01. 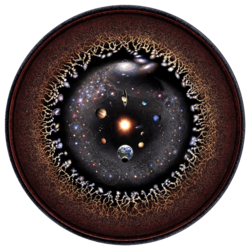 ↑ Edward L. Wright, "An Older but Larger Universe?" 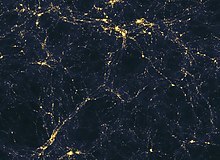 ↑ Biggest void in space is 1 billion light years across – space – 24 August 2007 – New Scientist. Space.newscientist.com. Retrieved on 2011-05-01. ↑ See Friedmann equations#Density parameter. ↑ ক খ New Gamma-Ray Burst Smashes Cosmic Distance Record – NASA Science. Science.nasa.gov. Retrieved on 2011-05-01.